Maravich Memories The LSU Years synopsis: Pistol Pete Maravich lit up the skies over Louisiana in his meteoric three-year career at LSU and emerged as college basketball’s all-time leading scorer with 3,667 points and an incredible 44.2 points per game average. Pistol Pete Maravich was a three-time All American and was named College Basketball’s Player of the Year. Pistol Pete Maravich… the name still rings in the ears of basketball fans across America. Who can forget the floppy socks, behind-the-back passes, between-the-legs dribbling, and the wondrous assortment of shots. Now experience the record-breaking career of college basketball’s most prolific scorer and greatest star. 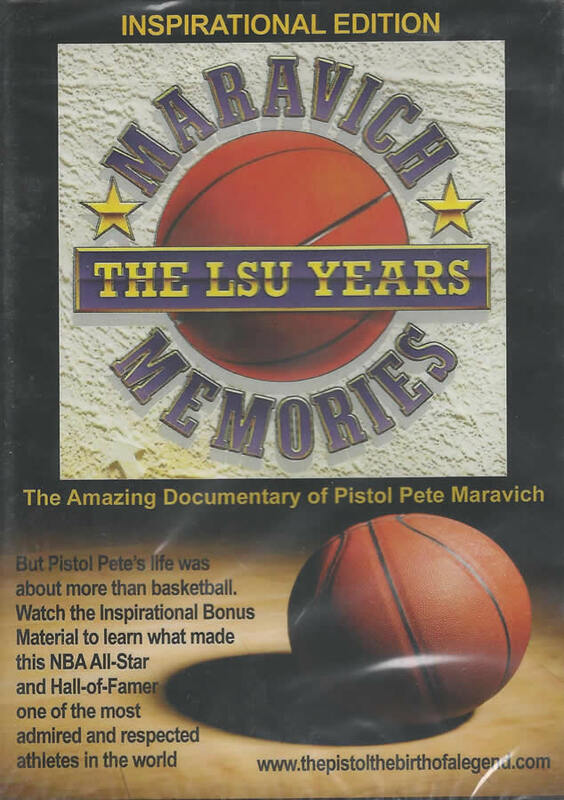 Maravich Memories – The LSU Years is the story of Pistol Pete Maravich through never-before-seen highlight footage, interviews and original music on this collector’s edition video.